Sen. Bernie Sanders' surprise victory over former Secretary of State Hillary Clinton in Tuesday's Michigan Democratic presidential primary came after many pollsters predicted she would win handily. The average of 18 major polls prior to Tuesday's primary indicated Clinton would win by 21.4%, according to an analysis by RealClear Politics. "We all blew it," said Steve Mitchell, CEO of Mitchell Research & Communications of East Lansing, Mich., in an interview Wednesday. Mitchell's firm showed a separation of 28 percentage points several days before the primary, based on an automated land line phone survey of 427 likely Democratic voters. Instead, Sanders got 50% to Clinton's 48%. 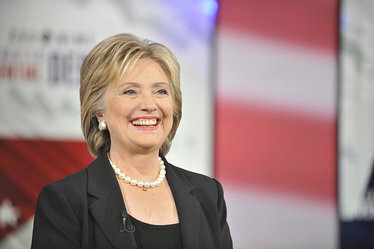 Former U.S. Secretary of State Hillary Clinton during the CBS News Democratic Presidential Debate at Drake University in Des Moines, Iowa, on Nov. 14, 2015. Why were so many pollsters so wrong? Here's part of the reason: Polling technology still relies heavily on surveys of voters that use landline phones, instead of voters -- primarily younger -- who rely entirely on smartphones and other cell phones. Based on exit polls, younger voters widely favored Sanders in Michigan -- as many 81% of those under age 30 supported the independent Vermont senator. More than 90% of that age group use smartphones and cell phones instead of land line phones, according to various estimates, including U.S. Census data. It is harder and twice as expensive to reach voters who use mobile phones to ask about their political views, Mitchell said. As a result, younger voters on smartphones are likely under-represented in many polls. "Millennials use cell phones," Mitchell noted. "In Michigan, clearly the voter turnout was much higher than predicted -- by half a million. That included more millennials" who backed Sanders. Other factors obviously came into play. After a contentious debate between Clinton and Sanders on Saturday in Flint, Mich., African-Americans only turned out 2-to-1 for Clinton, instead of the predicted 3-to-1 ratio, Mitchell said. "Everything went wrong for Clinton and everything that could go right went right for Sanders." Mitchell said his firm's polling prior to the Michigan primary did include plenty of millennials, or at least a group including millennials that ranged from age 18 to 39. That group made up nearly 9% of those surveyed. "We were getting them using land lines," he said. In a statement issued by Mitchell's firm on March 2, Clinton was leading Sanders by 28 points, with Clinton taking 61% and Sanders 33%. That release also describes the Mitchell methodology used in reaching voters, noting that it only included land line phone respondents. Because the calls were made with an automated system, Mitchell could not by federal law reach out to cell phone users. The statement also notes that primary voters are typically older, adding, "We believe there are sufficient land line voters to get an accurate sample." The Mitchell poll results did show Sanders leading Clinton, 58% to 39%, with 18- to 39-year-olds. Mitchell said Tuesday results will make his firm reevaluate its methods and use some form of digital polling to reach more young voters who use cell phones before a slew of primaries arrive next Tuesday. "I'm not going to go into the method we'll use next week, but we will use digital and phone polling and try to pick it right, especially for the Dems," Mitchell said. "We have to capture millennials better that we did yesterday. Being wrong is unacceptable." Mitchell said his firm will use a technique it has relied on with commercial clients, possibly one that allows a voting survey to reach a mobile device that involves geo-fencing. With geo-fencing, a pollster can know if the device is actually located within the voting district. That would protect from situations where a phone has an area code in a voting state, but is being used elsewhere. The well-regarded Monmouth University poll in the Michigan primary found on Monday that Clinton had a 13-point advantage over Sanders. That poll actually relied on reaching out to 704 likely voters from both major parties, including 260 who had cell phones as well as 444 who used land line phones. But only 302 of that 704 were likely Democratic voters, and it isn't clear how many of them were using cell phones. Patrick Murray, the pollster behind the Monmouth polls, could not be reached for comment. After at least 13 pollsters in January predicted Donald Trump would top the Iowa Republican caucuses, Texas Sen. Ted Cruz won instead. As with Michigan, the question of voters with cell phones was raised by experts in Iowa for what happened. "Polling as a whole is becoming more challenging as it gets more difficult to reach voters in a random manner and keep them engaged for a full survey," GOP media consultant Brad Todd told USA Today in early February. "Most media and university surveys are cheap and use methodological shortcuts that make them even more error-prone."